It's time for the Nokia Lumia 510 to get out of hiding and step into the light - it's an entry-level Windows Phone smartphone, which has some pretty decent specs. Starting with a 4" WVGA TFT screen, the Lumia 510 takes the lead on the Lumia 610, which has a 3.7" screen. The Lumia 510 also features a 5MP autofocus camera with VGA video recording (matching the 610). Camera geeks might also want to know that the camera has an f/2.4 aperture and wide angle 28mm focal length (in 35mm equiv.). So far, so good. The Lumia 510 is powered by a Snapdragon S1 processor, though we still don't know the exact specs (it's more than likely it uses the same Cortex-A5 CPU as the 610). The phone has only 256MB of RAM, which will probably limit app compatibility as we've seen with the Lumia 610. The internal storage is also limited - 4GB, non-expandable - which is another limitation to consider. Every Windows Phone comes with 7GB of free cloud storage on SkyDrive though this can be of little help when your internal storage fills up. The Nokia Lumia 510 comes with Nokia's proprietary GPS-navigation apps Nokia Maps and Nokia Drive. On the connectivity side, there's 2G and 3G with HSDPA, Wi-Fi b/g/n and Bluetooth 2.1. There's no NFC on the Lumia 510, at least not on this model. The original 610 didn't have it at first too, but then Nokia launched the Orange-exclusive Lumia 610 NFC. The Lumia 510 will run Windows Phone 7.5 at launch and will be updated to 7.8 as soon as it's ready. Speaking of launch, the Nokia Lumia 510 will first go on sale in China and India in November, then move to the Asia-Pacific and South America. Nokia estimates the phone will cost $200 before taxes and subsidies. At this price point, current Android smartphones will have a really hard time competing with the Lumia 510's winning combo of a 4-inch screen, 1GHz CPU, 5MP wide angle camera plus offline SatNav. 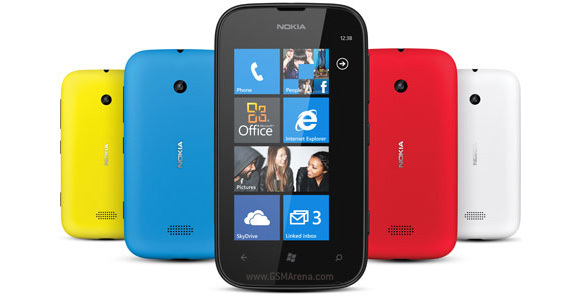 Is the Nokia Lumia 510 any good as a first phone for my 10 yr old?